The perfect pancakes to stay fit and full of energy all day long. Stir all ingredients except for greek yogurt, unsweetened chocolate syrup and blueberries. Mix it very well and cook into pancakes on a non-stick pan. 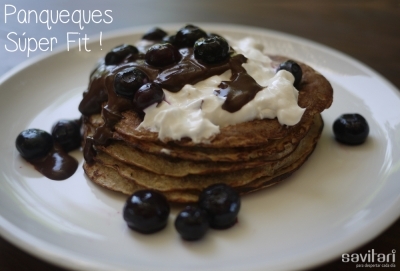 Top with greek yogurt, sugar-free chocolate syrup and blueberries.